In the current era, customers prefer to interact with the brand 24×7. It has become crucial for companies to have a strong presence in the digital space. One of the best methods for the businesses to engage the customers is through the website. A website allows businesses to pitch the services and products to customers. A well-designed web layout is crucial to the fortunes of the business. There is a no bigger turn off for users than a clumsily designed website. This is where the need for custom web development services arises. With the help of custom web development solutions, you can get an efficient web design. 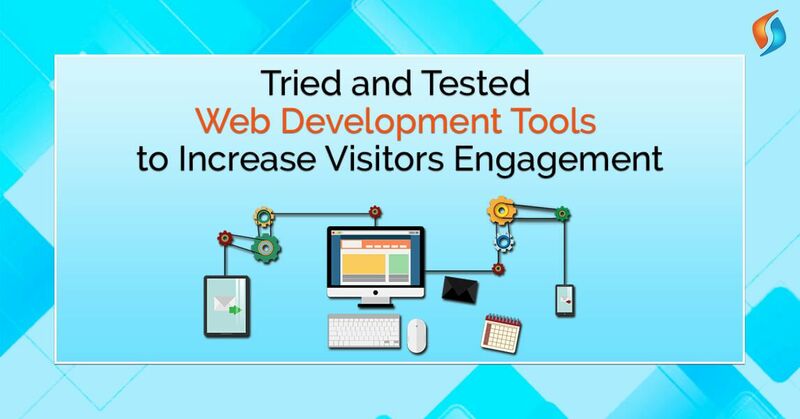 Various web development tools help with increasing the visitor engagement. Let’s know more about such tried and tested tools that can make all the difference for a website. Engaged customers are loyal to your brand. They are more likely to choose your products and services if the need arises. Companies with better engagement statistics have an increase in their revenue as well. The longer customers stay on your website; the better Google considers it to be. It will rank it higher in search results, driving more customers towards you. Thus, you need to avail of professional web development services for your website. This will help you maximize the opportunities to engage the customers. Gone are the days of boring and old contact forms. With the help of interactive contact forms, you can increase customer engagement levels. Customers can use the forms to ask a query, schedule an appointment, make payments from one place. There are all-in-one customer communication platforms that can help you with this. You can use the forms to generate leads and for customer engagement also. Availing services of an experienced web development company will be helpful for you. These are AI-powered programs that can perform specific functions on your website. AI Chatbots are one of the fastest emerging customer engagement tools available for you. Chatbots are available 24×7 for the customers to ask for any information. They not only provide answers to queries, but they can also make suggestions. Over a period, they start to understand customer behavior and patterns. This helps you understand the psyche of the customers. You can then plan your offerings to suit customer preferences. Chatbots can replace the element of human prejudice. Thereby helping engage the customers. Machine learning consulting companies can help you with chatbot development and deployment. Click-to-action buttons are an essential component of a website design. They allow you to drive the customers to take a corresponding action. Placing many click-to-action buttons across the website is an excellent tool. It will help you to keep the customers feel that they are in control. This way they are more likely to engage with your brand. Adding social media sharing buttons is also an excellent option for user engagement. It is because this layout is one of the best ways to provide information to customers. Also, it is most suitable for mobile websites and is so the preferred option for the leading mobility service providers. It allows you to present information compactly, and users are more inclined to read such information. As such, they spend more time on your website. This provides you with great opportunities to engage them. Making your website free from clutter is the best tool for user engagement. Strike a balance between text and visual elements, and make the website user-friendly. Because having a clutter-free and easy-navigation design enhances the visual appeal of your website. And visitors are going to stay on a website that is pleasing to read and browse. So, ensure that there is adequate white space to ease the reading of information. If you try and insert too many elements, visitors are more likely to jump to another website. Hire the best Custom Website Development Company in India! Given these points, it is essential for you to enlist a custom web development company. And this is where we come into the picture. At Signity Solutions, we are a leading custom web, mobile application development company in India. We have been helping our clients with our services for many years. Our team boasts of rich experience and has been delivering excellent results. Thus, for any web development services, feel free to get in touch with our team on IT outsourcing services. We will be happy to help you out. Contact us now!